Works well, looks good, very compact. May be too small for some - just 17 litre capacity / 24.5cm turntable. 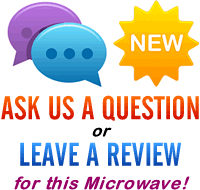 Looking to buy a small grill microwave? Bosch have created a very compact model in the form of the HMT75G451B - featuring a 17 litre capacity and 24.5cm turntable. 5 different power levels are included when in microwave mode, which goes up to a maximum of 800w. When in grill mode, it features a maximum power output of 1000w - not bad at all considering the modest size of this silver microwave. The LED display is pretty easy to read, and the controls simple enough to operate. The timer system goes up to 99 minutes, which is handy, although you will struggle to fit very large dishes and plates in this microwave, given the internal dimensions of 19.4cm by 29.0cm by 27.4cm. Overall build quality is good, and it feels like it's built to last. So who is aimed at? If you have a small kitchen or bedsit, and are after a tiny yet functional grill microwave, then this model will be ideal. It will probably be a touch on the small side for larger families and households, but for those who require a reliable method of cooking and grilling, it will be ideal. The Bosch HMT75G451B works well, but is a touch on the small side - check the dimensions prior to purchasing. 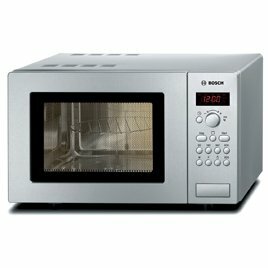 However, if space is of a premium, and you need a decent performing grill microwave, then this model is well worth considering. Can I have the external dimensions for this item please?